In previous posts I mentioned that you can visit the local fire stations and have a firetruck come to your school or event. One month ago I filled out the online form to have a truck visit Brooke’s preschool and today was the big day! If you want to do that same, all you need to do is fill out the online form at least 4 weeks in advance. 1. Go HERE to request a truck and give them 4 weeks notice (the minimum). 3. Be flexible. The firetruck will still be on duty, so the truck might be late or leave early. The station closest to your school will send the truck. I’ve found that if they are running late, they will call the cell phone number I provided in the request form. The firetruck arrived on time today and parked in the school parking lot (so the kids were away from the street). 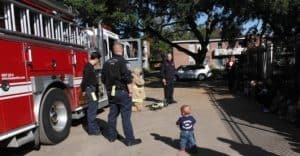 My favorite 32 preschoolers excitedly came out to meet 5 local fireman. The kids sat on the curb as they learned about fire safety and saw a fireman in his full gear. 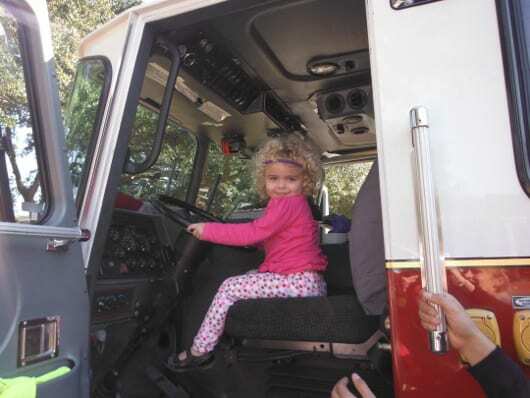 After agreeing to “stop, drop and roll”, to “get low and go” and to “always go to a fireman and not hide”, they kids got to walk through the truck cabin and then drive. After about 20 minutes, the kids went back to the playground and the firemen sounded the sirens as they drove away from school. What a great day at preschool! Go HERE to see the post from when the firetruck came to Joe’s preschool. Requesting a truck is really easy and is free. Definitely give it a try! Where in Houston? Mustang Cat Dealership - Decked Out for Christmas!